It’s a bit cruel, we know, but we’re not going to show you the full Business Model Map quite yet, despite the promise last time. We first need to get clear about what we mean by the two axes of the map that borrow from the latitude and longitude metaphor. distribute it in different ways via the standard channels and sales methods. Thus they assemble a portfolio of business models for paying off the network. We’ll go into more detail once we’ve done the map (next article in the series, I promise). This neatly and accurately describes the guiding principles of the first packet network pioneers, who sought to create a decentralized and “dumb” network. The “principle” was already redundant by the time the paper enunciating it was first published in 1984, however, and so it’s fair to say that none of today’s packet networks are “end to end” or “dumb”. If they were, they wouldn’t work, and you wouldn’t be reading this now. But “End to End” has taken on a quasi-religious significance over twenty years. It’s not just a buzzword, it’s a way of life! …the mobile is the first mass medium with a built-in payment mechanism [our emphasis]. This is a massive iceberg totally not understood by most even within the industry. Never before was there “click-to-buy” ability in any media. … What combines not only the convenience of the credit card — twice as many people have mobile phones than have credit cards, and kids as young as 7 years old have mobile phones while credit cards tend to have an 18 year age limit — but also the convenience of the credit card reading device? This discussion illustrates the observation that there may be no such thing as value-neutral design. The design and deployment of tunnels (or other mechanisms to mask what services are being used by a consumer) shifts the balance of power from the producer to the consumer. Given that value pricing is not a moral wrong, should the consumers be aided in their quest to bypass the controls of the producers? Those who see the consumer as “the little guy” being abused by the “big providers” will design such mechanisms, and this is part of the tussle [of network design], not something that happens outside the tussle. Our job is to put this into context and offer some constructive ways forwards. Getting the valuable bits delivered to the right places at the right times in vaguely the right order has always been a challenge. Every time the underlying transmission technology improves, we think of new ways of soaking up the capacity and creating a new capacity crisis at the cutting edge. Just when you thought HDTV was the worst-case capacity need, your local electronics store is trying to sell you whole-wall immersive displays. A dedicated transmission infrastructure sends signals encoded specially for reception in single-purpose listening devices. At the other extreme might be how we read Web pages such as this one. Whilst all the parts have to work together, they interface using multi-purpose components with standardised interfaces. Your PC can run many applications, your web browser can render many media types, and the whole system doesn’t need to progress in lock-step: there’s flexibility for different parts to advance at different rates. Now, nothing is absolute. You can create a radio that does unexpected things (such as taping shows) demonstrating ‘loose coupling’, or you can endure unexpected integration of content and hardware on your PC when some DRM scheme kicks in. The above models are simplified: there can, of course, be different transmission and reception media and devices; more layers of UI, operating system, and content packaging; and different forms of integration. Our map is a manual survey of the shape of the world, not a high-resolution satellite radar scan. For another example of technical integration, take a look at the recent and interesting paper by George Salisbury, a consultant to Detecon (a Deutsche Telecom company). He has analysed over 220 different communications services to see the trends in technical vertical integration. How many services in future are likely to be dependent on QoS promised from the network? Unsurprisingly he saw a strong move towards more modular, open and loosely connected value systems. It’s worth checking out some of the thoughts on tiering at the end, as we’ll be re-visiting those. For our other axis we’ve picked by far the most important non-functional aspect of any communications system - the money. How does the money for the service follow the cost of sending the bits? Let’s take a physical-world example first. The free postage offer from Amazon shows a high commercial coupling of the transmission (delivery) with the service (product). I pay for both in one transaction, and never even know how my money is really allocated between them. The “FREE” is an illusion we are happy to live with. 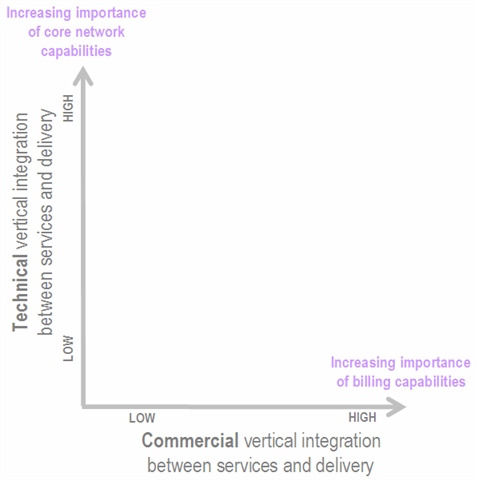 Yet there is no technical integration of the delivery and product. UPS doesn’t need to start up a special delivery service for this product line, nor for “free postage and packing” items. The user is charged 5¢, and this is automatically channeled into a handset subsidy payment, the “postage and packing” costs of physically delivering the message, together with a termination fee to the recipient network. Some is retained as profit. This is what has Tomi Ahonen so excited above, and what I personally was trying to do for mobile web pages back at Sprint five years ago. 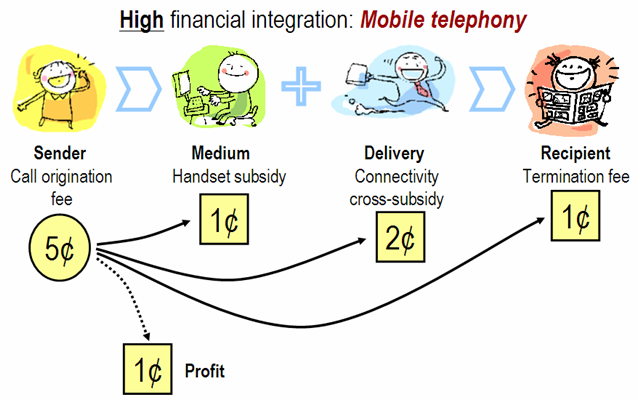 There can be many patterns of how money flows between the sender, medium, delivery agent and recipient. Telephony sees many of them: freephone calls, international toll calls, premium rate calls, reverse charge calls, and so on. Yet we don’t see the equivalent of the freephone call for mobile data — yet. Which is precisely where we want to take you! Note that the user doesn’t need to separately provision any kind of payment in a tightly commercially integrated system. However, they certainly can if they wish to and bypass the operator. For example, I’ve been using Vyke to bypass expensive roaming costs and send SMS messages over GPRS for pennies using my Vyke pre-paid balance. What operator’s can’t do today is strike a middle ground, and offer me a high-quality, low-latency virtual pipe over which to run mobile Skype — whilst (and this is the key bit) letting my email and daily remote backup operate separately at lower cost. The converse case from high integration might again be a PC, where you separately pay for the hardware, software and connectivity with no cross-subsidy. This is an example of low commercial integration of the parts. Companies like Dell foist endless pre-installed goodies onto their PCs in the hope of up-selling you some more software. This is an example of media-based distribution — one of the patterns for moving bits — coupled with a particular commercial model (free trial). Our map aims to show all the main combinations of the technical transport medium and commercial model and how they change over time. What we really want is to keep the network relatively dumb because that makes it flexible. We want just enough network smarts to help us keep out nasties of spam, fraud and mischief. At the same time we want to keep the goodness of some kind of integrated payment and value-based pricing. These are what gives us the rational economic model that has served the mobile world so well to date. And in our next article, we’ll finally get to see the land at the far side of the ocean.